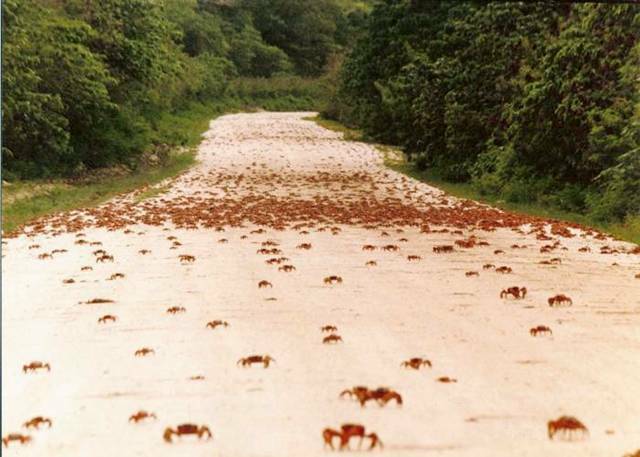 At the beginning of the wet season (usually October / November), most adult red crabs suddenly begin a spectacular migration from the forest to the coast to breed. Breeding is usually synchronized island-wide. 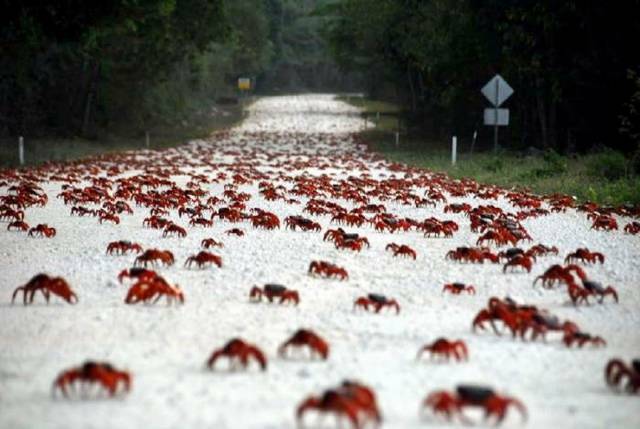 The rains provide moist overcast conditions for crabs to make their long and difficult journey to the sea. 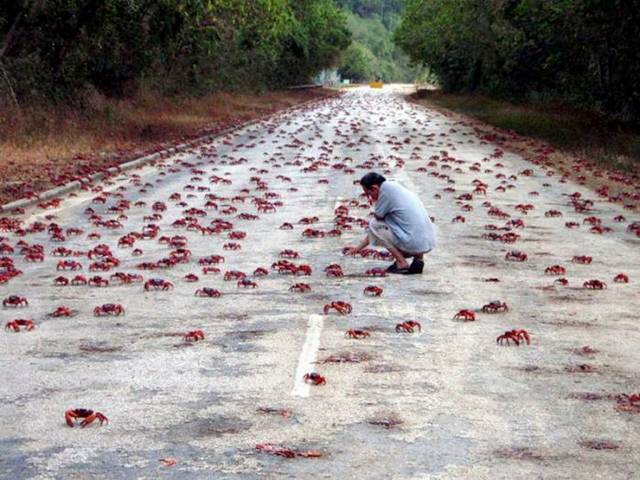 During peak migration times, sections of roads where crabs cross in high numbers may be closed to vehicles for short periods of time. You can park your vehicle and carefully walk amongst the moving sea of crabs as they relentlessly make their way to and from the shore. The easiest places to watch the crab migration and the females spawn are at Drumsite, Flying Fish Cove, Ethel Beach and Greta Beach. 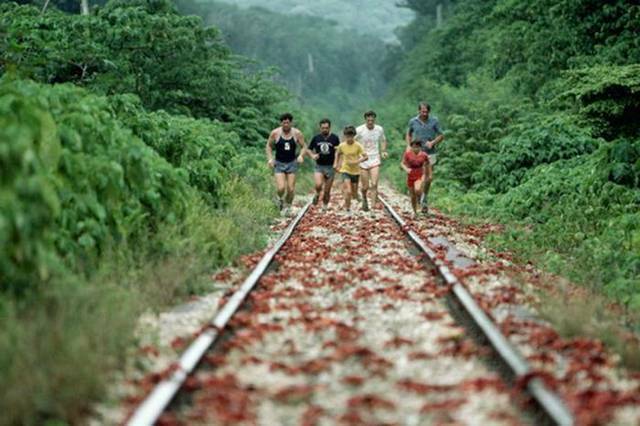 Updates on public notice boards and local radio give crab movements during the migration. While the rains provide the moist preconditions for the march to begin, the timing of the migration breeding sequence is also linked to the phases of the moon. 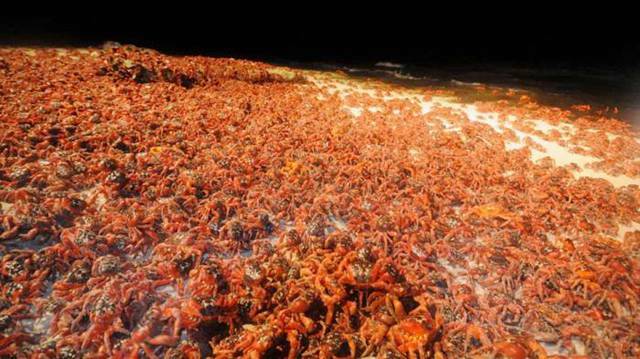 Eggs are released by the female red crabs into the sea precisely at the turn of the high tide during the last lunar quarter. The sea level at the base of the cliffs and on the beaches, where the females release their eggs, at this time varies the least for a longer period, and it is therefore safer for the females approaching the water's edge to release their eggs. Sometimes there are earlier and later migrations of smaller numbers of crabs but all migrations retain this same lunar rhythm. Males lead the first wave of the downward migration and are joined by females as they progress. Larger males arrive at the sea first (after about five to seven days) but are soon outnumbered by females. 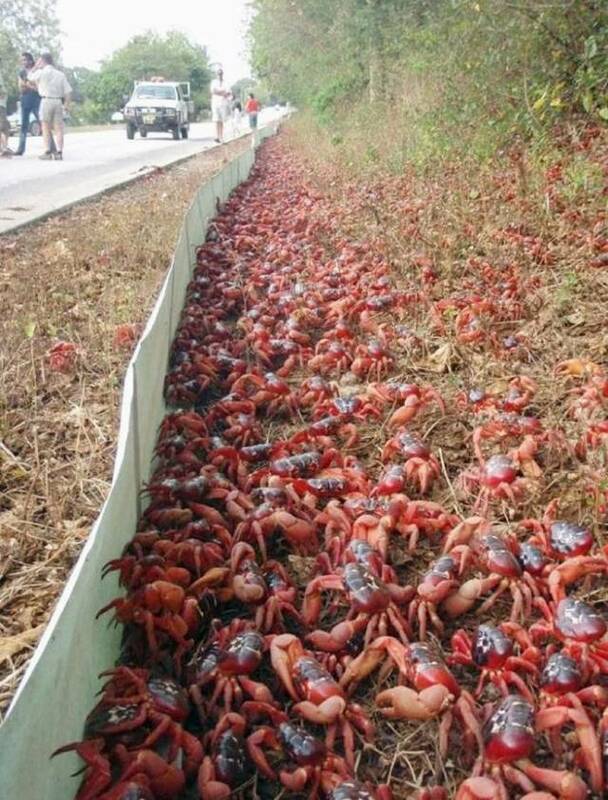 The crabs replenish moisture by dipping in the sea.The males then retreat to the lower terraces to dig burrows. The density of burrows is high (one to two per square metre) and males fight each other for burrow possession. The females move to the terraces and mating occurs. After mating, males dip again and begin returning inland. The females produce eggs within three days of mating and remain in the moist burrows on the terraces for 12-13 days while they develop. The eggs are held in a brood pouch between their extended abdomen and thorax. A single female can brood up to 100,000 eggs. In the morning and late afternoon around the last quarter of the moon, the egg-laden females descend from the terraces to the shoreline. They pack into shaded areas above the waterline, in densities of up to 100 per square metre in some places. The females usually release their eggs into the sea toward dawn, around the turn of the high tide. Release of eggs may occur on five or six consecutive nights during the main breeding migration.